One morning while getting coffee in the kitchen at work, I happened to glance into the trashcan. A stack of six-pack rings sat neatly on the trash heap. It’s such a waste they get thrown out after being used just once to keep soda cans together. The plastic has an interesting shape. It’s pliable and translucent. I figured out a simple way to highlight the six-pack rings’ attributes and lift them to a wonderful new use. I found inspiration in Harri Koskinen’s Block Lamp. A simple block of solid glass encases a light bulb. It looks like the light is suspended in ice. A stack of six-pack rings could do the same. That was an OK idea, but I wanted to push it further using all the attributes of six-pack rings. Bear with me. I'm about to get a little nerdy and mathematical! 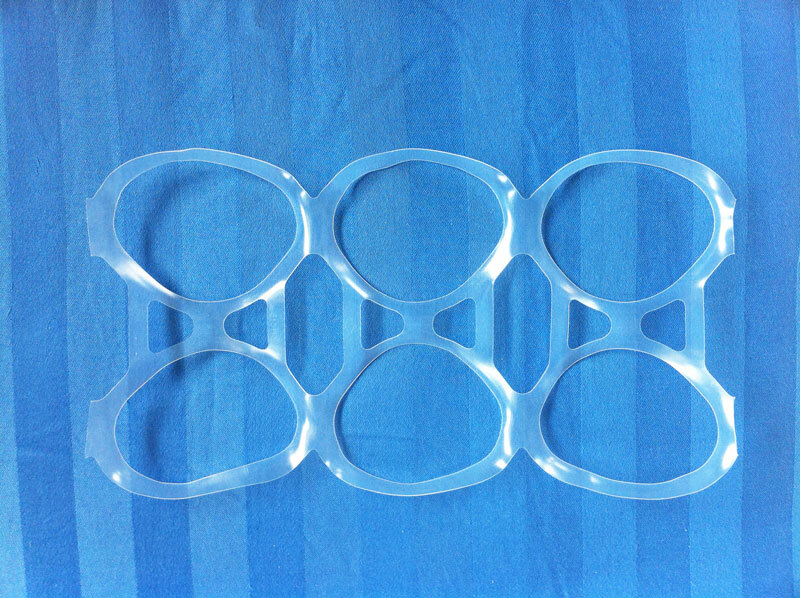 Six-pack rings are flat planes. A simple extrusion of a plane creates a block, but revolving a plane would make a more interesting volume. 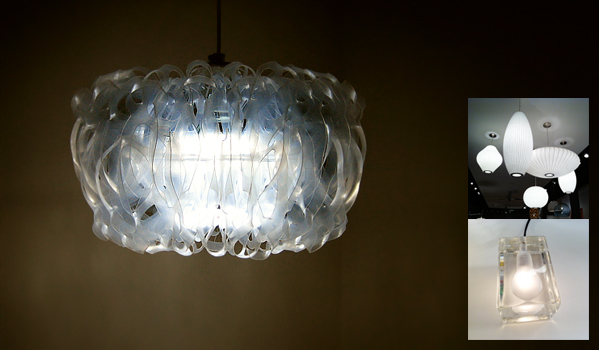 George Nelson’s iconic Bubble Lamps are the inspiration for this point. I love the clean, simple and sophisticated volumes. This is just the approach we need to give more dimension to six-pack rings. Let's make it better! The diameter of the large plastic take-out container lid is about 10"
If you don’t drink a lot of canned drinks, visit your local convenience store, grocer, or drugstore and ask the stock person for six-pack rings. You can also ask friends and family to collect six-pack rings for you. Position the socket of the pendant light in the middle the of the plastic lid. Using the marker, trace the socket of the pendant light. Repeat steps 1 and 2 with the coffee mug. Draw four evenly spaced 3/8” wide spokes with the ruler. Using the X-Acto knife cut the out the center circle for the socket opening and the space between the spokes, leaving the rim of the lid intact. Cut the rim in the middle between each spoke. Between each spoke, overlap one side of the rim 1” on top of the other and snap into place. Using the Dremel tool, drill two holes, ¼” in from each side of the 1” overlap. Take one six-pack ring and fold it in half widthwise, making sure the concave surface of the ring is inside the fold. 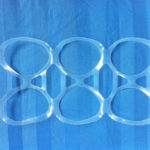 String the folded six-pack ring onto the rim by insert the rim through the small holes on the open side of the six-pack ring. Clamp a binder clip or clothes pin rims to prevent the six-pack rings from sliding off. Snap each the rim back together. Strip the paper or plastic covering off the wire tie. Pass the wire through the holes in the rims and twist to close. Repeat steps 11-15 for the remaining 3 sections. Using the X-Acto knife cut the bottom and top off the can. Carefully fold the aluminum sheet in half. Use the scissor handles to help press down the crease. Fold it in the opposite direction to snap the sheet into to separate pieces. Repeat steps 12 and 13 to all aluminum pieces until you end up with ¼” wide strips. Fold and snap the each strip in half. The resulting strip will be around 1 3/4" long. Make a ¼” hook on one end of each strip. Rotate the six-pack rings, alternating the direction the fold to point up towards the socket opening or to point down away from the socket opening. 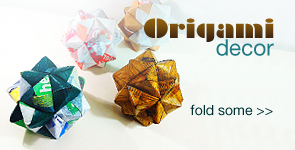 You will end up with 30 six-packs rotated with the folds on top and the other half rotated downwards. The top six-pack rings has a ring of loops surrounding the socket opening. 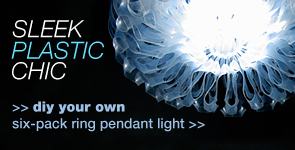 Flip all the loops down and back toward the towards the center of the pendant light. Wrap an aluminum strip around all adjacent sides of the loops. Repeat step 26 for the inside of loops on the bottom. Insert the pendant light socket and screw in the LED light bulb. Let there be light! You've successfully coupled six-pack rings with Modern sophistication. Hang it in a space you think could use a bit of contemporary cool! 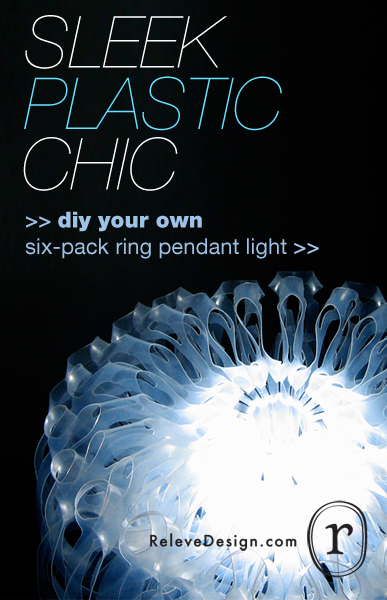 Nowadays six-pack rings are made of photodegradable plastic. Don’t hang your pendant light in front of a window. Keep it away from direct sunlight. Since the six-pack rings are plastic, don’t hang your pendant light near a heater, fireplace, or heat vent. You don’t want it to start melting. Always use LED light bulbs. They give off less heat, so they won’t melt your pendant light. I use Philips AmbientLEDs that I buy from Home Depot. They are dimmable and give off nice warm light. LED light bulbs are also energy efficient and last for years. You’ll save money. I’m FASCINATED! Your projects and ideas are FANTASTIC! I’m so glad you like it. I have more tips and projects coming! And keep commenting! I’m always open to feedback, cause it helps me improve the projects and tutorials. I was blown away by your designs from things we discard everyday. I’m not a DIYer, I’m a buyer. (LOL) I have to give this six pack lamp a try! It seems easy enough, although collecting the plastic rings seem to be the challenge. I’m determined to make the lamp. Wish me luck! I know exactly what you mean about being a buyer instead of a DIYer. Hopefully, I can change your mind. If you don’t drink a lot of soda, visit your local convenience store, grocer, or drugstore and ask the stock person, using the nicest “pretty please with cherry on top voice” you can muster, to give you their six-pack rings. You can also spread the word amongst friends and family. I’ve gotten quite a few doing both. 60 is only a recommended number. You can use less if you want. I’ll update the post to include more details on that tip. Good Luck, PinkPuf! But I don’t think you’ll need it, cause I have all the confidence that you’ll be able to make one! And if you do get stuck by all means send me a note. Thanks, again! You are now my patron saint of thrift, creativity, and kewlness! Amazing!!! WOW! I’ve never been anyone’s patron saint before. LOL! Well, I’m just glad that you allow me to share my ideas with you! Thank bunches and bunches, Amy! I’m so excited! I’ve collected my sixty six pack rings, I have everything but the light kit and the lid from a take out container! Watch McDonalds here I come for a salad. (for the lid, which I hope is the right size.) If it’s not the right size, what do you recommend for an alternative??? That’s wonderful, Kim! Hmm…Let me see what I can come up with for you as an alternative. Hi Kim! I’m still working on an alternative. I’m going to see how wire hangers work out. How is the plastic lid from the salad working out? We absolutely love your work and would be delighted if you would share one or more of your Make-It-Yourself designs with us. i saw you on the nate show and then watched you again on the repeat! i love, love, love your ideas and creations!!! 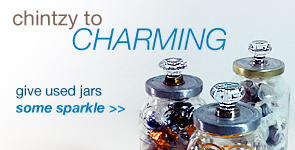 i so want to try your pendant light. the video was professional and really helped. Gosh! Thanks for watching! I’m so glad you like my projects. 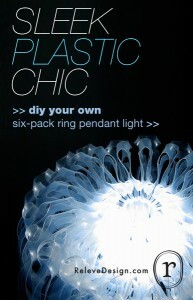 Funny you should mention the six-pack ring pendant light. 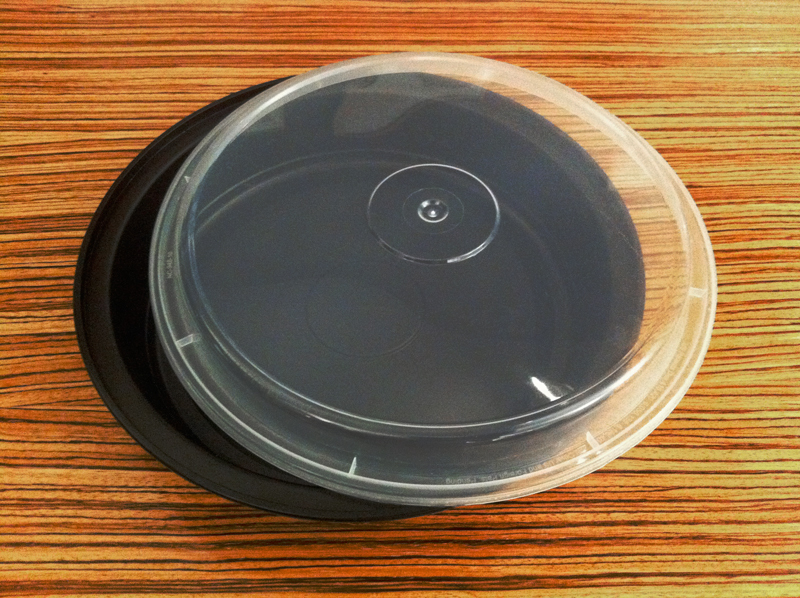 I’m actually working on an alternative to the plastic takeout container lid. Some people can’t get their hands on one, so I’m going to figure something else out. Thanks for watching the show, visiting me, viewing the video, and taking the time to write such kind words. I truly truly appreciate it, p who! OMIGOSH, Adrian! Thank you so much for the wonderful write up! I was so over the top when I saw you on Nate’s show, you have such a creative spirit and love your simple but sophisticated designs. It is special you share your DIY tutorials with the world. I was over the top that I had the opportunity to share my work with the rest of the world. I’m overwhelmingly honored and unbelievably grateful to you and everyone who has responded to my work. It can be difficult to write and film videos late into the early morning hours, but knowing that it helps spur creativity in others makes it all worth it. Adrian, I’m so glad you’re here! Thank YOU!